Why concrete layers USE Aquron 300 Additive for Waterproofing Concrete? Improves Workability -Aquron 300 Additive for Waterproofing Concrete improves Pumpability, Workability, while being safer use, but still providing a very homogenous concrete to place and finish. Concrete Layers will notice improved workability making Placing and finishing is faster with Aquron 300 Additive for Waterproofing Concrete and no other admixtures required. No VOC’s. Being liquid eliminates exposure to Hazardous cacogenic dusts. 3n1 - Waterproofing/Improved Strength/Reduced Shrinkage - Aquron 300 Additive for Waterproofing Concrete is a simple and cost effective alternative to multiple additives being used in one mix. AQURON 300 you only need the one product instead of for example “waterproofing additive with a pump-aid and then a shrinkage reducing additive”. This helps reduced costs and eliminate compatibility issues between products and suppliers. Safer and Simpler to Use - Aquron 300 Additive has NIL VOC’s, and is a NON-HAZARDOUS LIQUID, making this additive a more environmentally friendly preferable option for GREEN BUILD projects. Being a liquid form Additive for Concrete makes AQURON 300 easy to handle and very simple to use, while completely eliminating exposure to fine cacogenic dust associated with heavy bagged powder additives. Reduce Shrinkage of Concrete = Reduced Cracking risks - Aquron 300 Waterproofing Additive improves hydration of concrete by transforming moisture into a hydrogel. Improving hydration in turn improves achieved concrete strengths, reduces drying shrinkage and slab curl which are major factors in reducing random cracking. Improve the Curing & Hydration of concrete - Aquron 300 Additive for Waterproofing Concrete transforming moisture into a hydrogel assist the curing process to improve hydration through the concrete. Aquron 300 Additive for Waterproofing Concrete keeping an even humidity in concrete tends to lower the heat of hydration in the concrete’s porosity. AQURON 300 is not a curing compound. Stronger Concrete - Aquron 300 Additive for Waterproofing Concrete improves achieved strengths, increases both flexural and tensile strengths by improving concrete hydration. 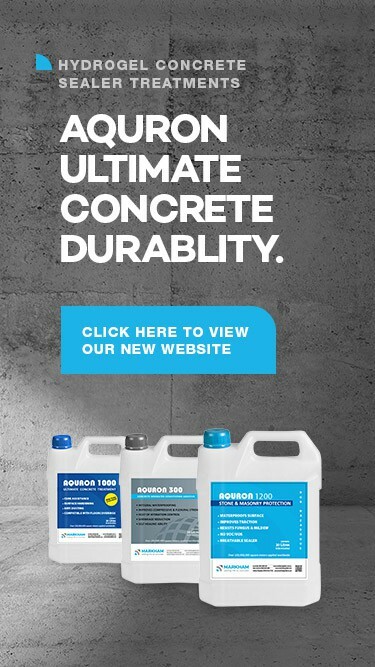 There are no other additives on the market that waterproof concrete while increasing strength. Permanent Concrete Waterproofing - Aquron 300 Additive for Waterproofing Concrete transforms moisture and produces a hydrogel throughout porosity making the concrete internally waterproof. AQURON waterproofing being inside the concrete cannot be worn or abraded off, and is as permanent as the concrete itself.